Eurypygiformes is an order formed by the kagus, comprising two species in the family Rhynochetidae endemic to New Caledonia, and the sunbittern (Eurypyga helias) from the tropical regions of the Americas. Its closest relatives appear to be the tropicbirds of the tropical Atlantic, Indian, and Pacific oceans. The Eurypygiformes' affinities are not too well resolved. They are two families from a Gondwanan lineage of birds. Suggested by some morphological characteristics they were initially classed as members of the family Ardeidae and later the Gruiformes. According to Jarvis, et al. 's "Whole-genome analyses resolve early branches in the tree of life of modern birds", the group is distantly related to the Phaethontiformes. 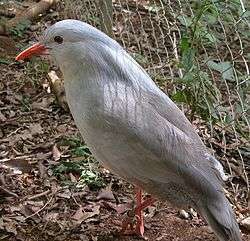 When seen as a gruiform, the kagu is generally considered related to the extinct adzebills from New Zealand and the sunbittern from Central and South America. Recent studies do indicate that the sunbittern is the closest living relative of the kagu. For example, Fain & Houde found these to be certainly sister taxa and Furo et al. indicated a close phylogenetic relationship them by cytotaxonomy, they suggest that their common ancestor was separated by the Gondwana vicariance in South America and New Caledonia, respectively. They and the mesites did not group with traditional Gruiformes in their study, but instead with their proposed clade Metaves, which also includes the hoatzin, pigeons, Caprimulgiformes, flamingos, tropicbirds, Apodiformes, sandgrouse and grebes. The internal structure of this group was not well resolvable by their data, and contains numerous groupings which not otherwise corroborated (such as Caprimulgidae and flamingos). The usefulness and monophyly of "Metaves" is therefore unclear. Notwithstanding, the kagu and sunbittern – and possibly the adzebills – seem to form a distinct Gondwanan lineage of birds, possibly one order, possibly more, even though the relationships between them, the mesites, and the "core Gruiformes" are not yet resolved. 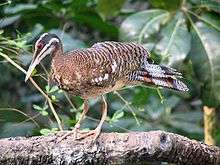 It is notable, however, that the sunbittern and the mesites possess powder down too, whereas the "core Gruiformes" do not. While the kagu is the only living species in the family Rhynochetidae, a larger species, the lowland kagu (Rhynochetos orarius), has been described from Holocene subfossil remains. The measurements of this species were 15% bigger than Rhynochetos jubatus, with no overlap in measurements except those of the forelimbs. Given that the sites where R. orarius were all lowland sites, and that no fossils of R. jubatus were found in these sites, the scientists that described the fossils suggested they represented highland and lowland species respectively. R. orarius is one of many species to have become extinct in New Caledonia after the arrival of humans. The validity of the species has been questioned by some authors, but accepted by others. Jarvis's 2014 full-genome analysis of the extant bird orders shows a distant relationship of this group to the tropicbirds, with these two groups together forming the sister group to the "core water birds, or Ardeae. This analysis abandons the Metaves hypothesis. ↑ Furo, Ivanete de Oliveira; Monte, Amanda Almeida; Santos, Michelly da Silva dos; Tagliarini, Marcella Mergulhão; O´Brien, Patricia C. M.; Ferguson-Smith, Malcolm A.; Oliveira, Edivaldo H. C. de (2015-12-01). "Cytotaxonomy of Eurypyga helias (Gruiformes, Eurypygidae): First Karyotypic Description and Phylogenetic Proximity with Rynochetidae". PLOS ONE. 10 (12): e0143982. doi:10.1371/journal.pone.0143982. ISSN 1932-6203. PMC 4666659 . PMID 26624624. ↑ Balouet, Jean C.; Storrs L. Olson (1989). "Fossil birds from Late Quaternary deposits in New Caledonia" (PDF). Smithsonian Contributions to Zoology. 469: 28–32. doi:10.5479/si.00810282.469. ↑ Steadman, David (2006). Extinction and Biogeography in Tropical Pacific Birds. Chicago: University of Chicago Press. p. 158. ISBN 978-0-226-77142-7.